For many years after the Harvey House closed, the building continued to serve the Atchison Topeka & Santa Fe Railway as a depot. Many local men and women worked in the building and/or climbed aboard trains as trainmen, conductors, engineers and more. We’d like to acknowledge and honor these folks as being part of our town’s railroad heritage. 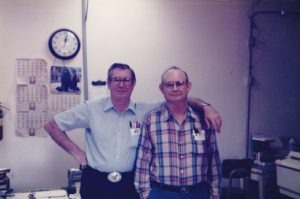 To start things off, here are my uncle and dad, Harold and Tip Culver, who began working as clerks in the day of the teletype and retired in the computer age. This photo is from around 1994 I believe, taken in the Harvey House building where they worked daily. Notice the pocket protectors and multiple pens! They kept the trains around here in order, and from running into each other, for many years. Please share with us your pics and stories, too.